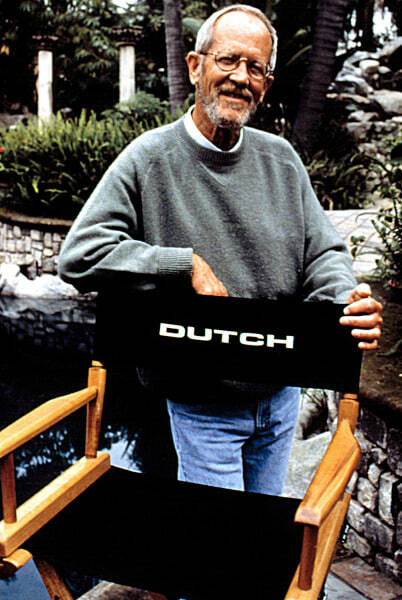 Elmore Leonard on the set of "Get Shorty" in 1995; his nickname was "Dutch." Elmore Leonard, who died Tuesday morning, was one of America's great novelists. But his gritty sense of realism and often hard-boiled words were never limited to the printed page: For over 60 years, his stories and novels have had fresh, vibrant lives in film and television. The fact is, Hollywood scriptwriters just love his characters. While 26 of his novels and short stories have so far been adapted for the screen, he's one of the few writers to have created characters memorable enough to span the decades, and find homes in multiple projects. To put his career in perspective you have to go back to the middle of the last century. His 1953 story "Three-Ten to Yuma" was made into a film (re-titled "3:10 to Yuma") in 1957 and was remade in 2007. "Get Shorty," a 1990 novel that became a 1995 dark comedy of the same name, starring John Travolta as a gangster named Chili Palmer who wants to get into the Hollywood biz. The sequel, "Be Cool," was released in 2005 and was based on Leonard's 1999 novel — and brought Chili and Travolta back to the screen. Even "Justified," FX's critically-acclaimed drama starring Timothy Olyphant as U.S. Marshal Raylan Givens, hearkens back to a regular Leonard character; the laconic lawman appeared in the novels "Pronto" (1993) and "Riding the Rap" (1995); the 2001 short story "Fire in the Hole" became the basis for the series' pilot, while Leonard's novel "Raylan" just came out in 2012. John Landgraf, chief executive officer of FX Networks, called Leonard a "treasure" and "one of the greatest contemporary American writers" in a statement. "'Justified' was the first television show to successfully translate his work to television," Landgraf added. "Elmore was thrilled by the way in which Graham, Tim and the rest of the 'Justified' creative team brought his characters to life. It was one of his proudest moments, and we are honored to have been a part it. He was a genius, and a gentleman, and he will remain in our hearts." That said, Leonard wasn't shy about sharing his opinions with those who adapted his works. "Justified's" executive producer Graham Yost told The Star-Ledger in 2010 that he had a bracelet made for all of his writers, reading "WWED," as in "What Would Elmore Do?" "In terms of adapting (him), I’d always felt that the best jobs had been done by Scott Frank in ‘Get Shorty’ and ‘Out of Sight,'" Yost said, "and I always felt that one reason his work was so strong in adapting Elmore was that it seemed to me he used a lot of Elmore’s dialogue in the scripts. And there were points when I was writing the pilot where, literally, I would be thinking, ‘What’s Raylan going to say next?’ And I would go, ‘Well, what does Elmore have him saying next? And let’s try that, because that will be good.’"
Meanwhile, don't think that just because Leonard has gone, his works won't continue to resonate. There are several projects still due to come out in the coming months, including "Life of Crime," a film starring Jennifer Aniston based on his 1978 novel "The Switch," and "The Arrangement," a USA Network pilot that was adapted from his 2002 short "When the Women Come Out to Dance."